The red dot at the center of this image is the first near-Earth asteroid discovered by NASA's Wide-Field Infrared Survey Explorer, or WISE. 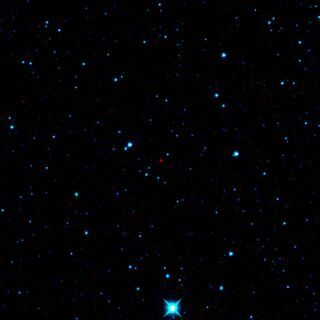 The asteroid appears redder than the rest of the background stars because it is cooler and emits most of its light at longer infrared wavelengths. In visible light, this space rock is very faint and difficult to see. Editor's note: Due to an error by NASA in a press release, the original version of this story stated that the WISE mission discovered hundreds of asteroids per day. That figure has been amended in this story to reflect the correct tally. Dozens of asteroids that have been lurking undetected in our solar system are being discovered every day by NASA?s newest space telescope, scientists say. The Wide-field Infrared Survey Explorer (WISE) telescope was designed to search for "dark" objects in space, such as brown dwarf stars, vast dust clouds, and yes, asteroids. Many of the asteroids WISE is spotting are darker asteroids that were likely missed by past surveys conducted by visible light telescopes. Finding these lurking asteroids could be important if any of them are on an orbit that sends them close to Earth. Most of the asteroids seen by WISE are in the main asteroid belt between Mars and Jupiter, but a fraction of them are Earth-approaching asteroids ? the kind that could wipe out much of life on the planet if they collided with it, as is thought to have happened to the dinosaurs. "WISE has only been in orbit for about three months, but we've already found a handful of asteroids classified as 'potentially hazardous,' including one seen in 1996 but lost until re-observed by WISE," said Ned Wright, a WISE team member and a physicist at the University of California in Los Angeles. Potentially hazardous asteroids are those that pass within about 5 million miles (8 million kilometers) of Earth's orbit. One of WISE's asteroid discoveries will cross Earth's orbit less than 700,000 miles (1.1 million km) away, Wright said. That's about three times the distance from the Earth to the moon. Between now and late October, when the mission is slated to end, Wright estimates the observatory will find a hundred thousand asteroids, mostly in the main belt, and hundreds of near Earth objects. NASA launched the $320 million WISE observatory in December. The space telescope is expected to complete its first all-sky map during its first six months of its mission.